The dining room is much more than a space where you cook and eat your food. It would become the hub for get-togethers, celebrations, entertainment and other social activities. As such, it should provide enough space to facilitate movement, storage and even décor. As your family grows, the dining room would be the first places where the footfall increases most. Here are some ways to add to your storage. Check out these unique ideas for shelves. 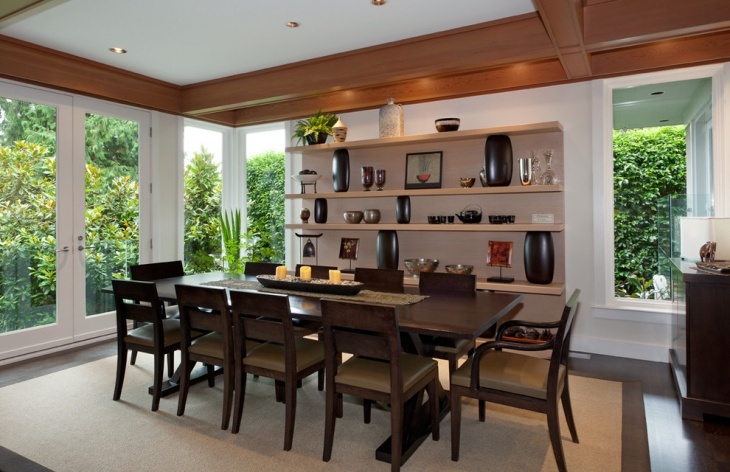 Corner floating shelves make a perfect idea if you are low on floor space in your dining room. This will create an easily accessible space for keeping your essentials or even help with adding decorative elements to the theme. As such, you can use all and any corner of your dining room for the same. 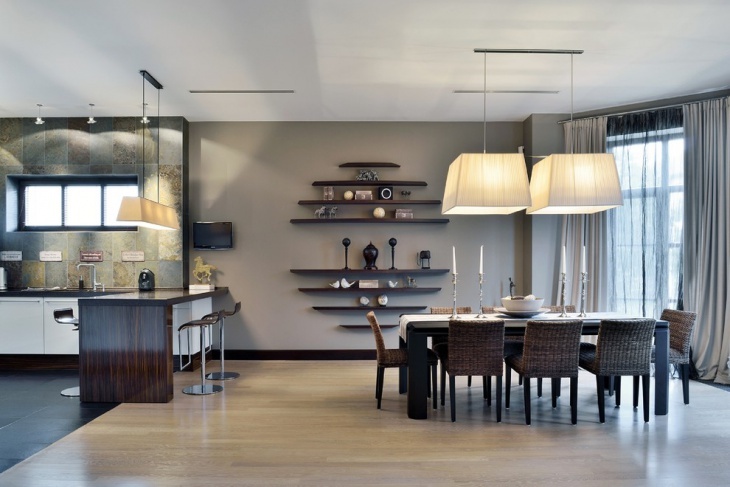 Floating shelves have come up as a unique trend in dining room designing. Well, it does provide the advantage of creating storage space out of air! You can have floating shelves anywhere on your walls and needn’t worry about extending it to the base of the room. However, floating shelves aren’t quite meant for heavy storage. Glass shelves present dual advantages. Firstly, they allow unlimited storage and secondly, they don’t creep upon the visual space. 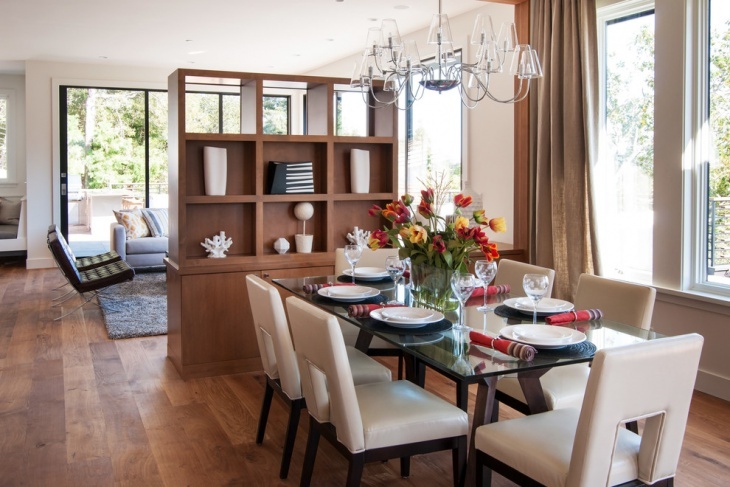 Glass storage is especially useful for dining room with limited floor and wall spaces for storage. However, you can also choose to use them uniquely to create an interesting décor scheme around the room. Open shelves can be an interesting addition to any room if you have a flair for creativity. As shown in this example, you can put in a lot of different objects to add personality to the space. This will also be a perfect opportunity to do something different with all the glasses, mugs, cups and plates you have at home! In this example, floating shelves create an exciting and extraordinary décor addition to the wall. The layered floating shelves can be a unique idea to add decorative elements to the room. However, make sure you compliment the setting with the right kind of lighting. Also, keep the floor layout to the minimal. Well, this would be a common sight in most traditional homes around Europe. 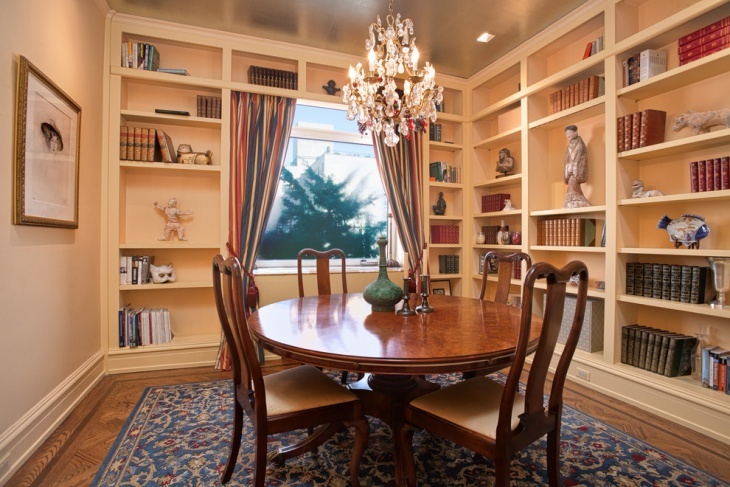 The white themed dining room and its storage spaces look inconspicuous. However, these square shelves would also be a great space for keeping decorative architecture like big vases and unique pottery. If you have fused your dining space with the living space, adding some unique storage to the walls would be a great idea. As shown in this example, these wall shelves can be the perfect opportunity to add to the décor using unique installations. The items that go into the shelves could be anything you are passionate of. In this case, the same functionalities have been achieved but on a different color scheme. 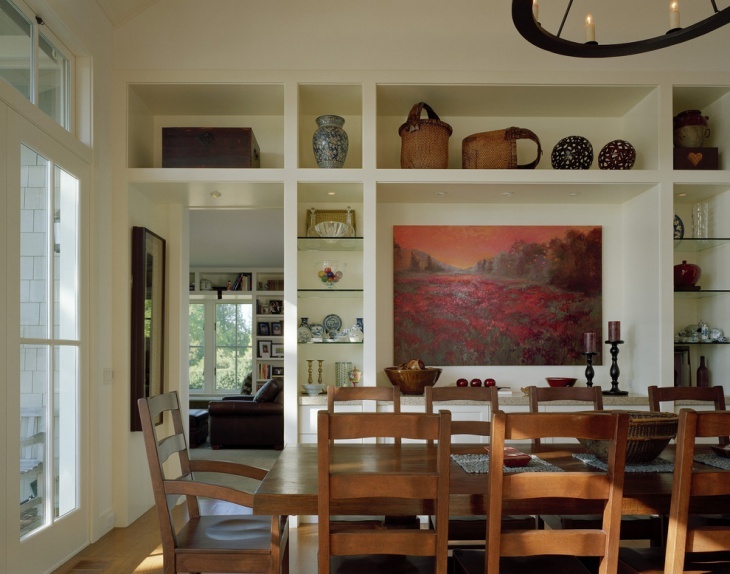 The floating shelves here follow a rustic theme and so do the certain décor items placed in them. 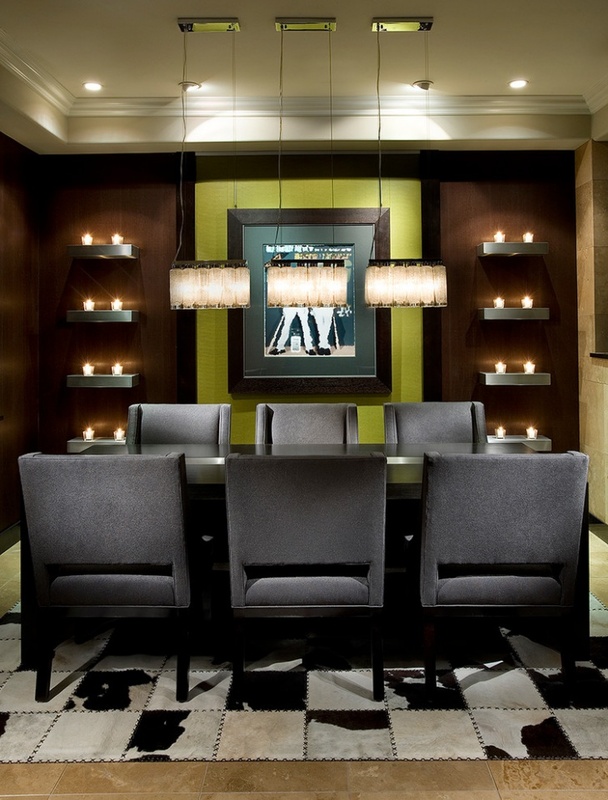 Achieved at the side of the dining area, this can be a great addition to any home. Now, this is something unique and interesting. The wood wall shelves, in this case, come in the form of square platforms and open ended on both sides. Using a combination of shapes, you can always liven up the setting. 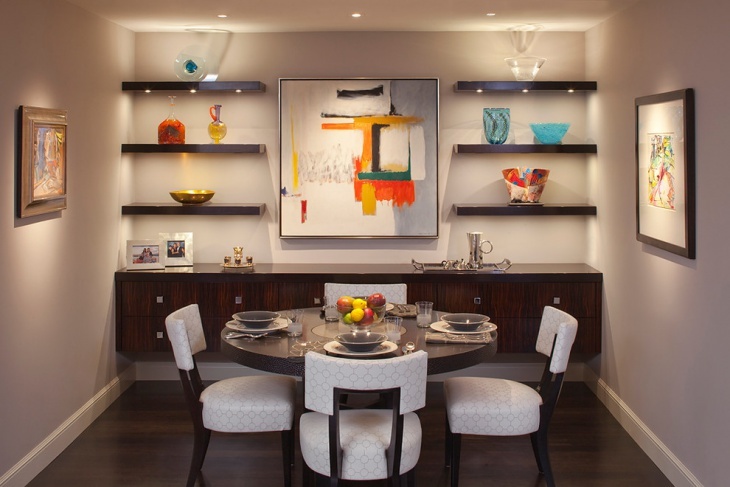 These have been some of the gorgeous designs for integrating a shelf space in your dining room. We hope that you use them to your requirement. 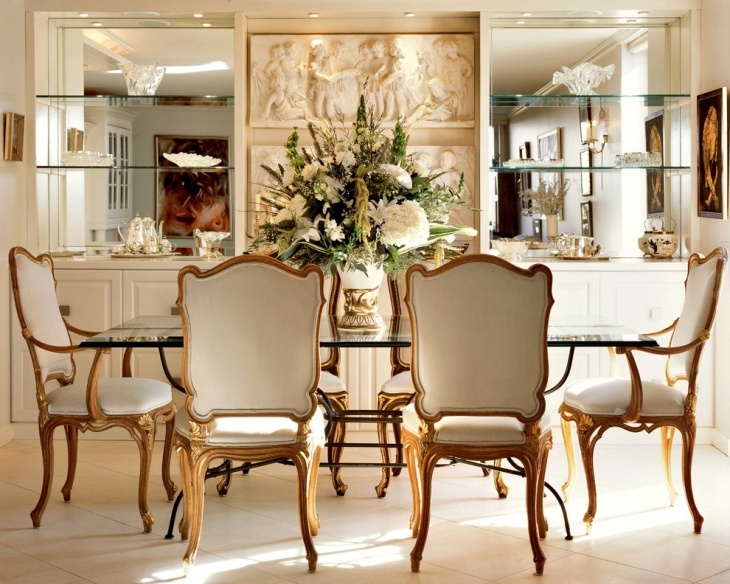 We would certainly like to see what you make of your dining room cabinets.